>WITH LANVIN JOINING H&M, WILL THERE EVER BE AN AFFORDABLE LUXURY DESIGNER PLUS LINE? For all you high fashion lovers Lanvin is set to do a designer collection with H&M. The launch of both womenswear and menswear will be available on November 20th in 200 H&M stores worldwide. Images from the collection will be available on November 2. 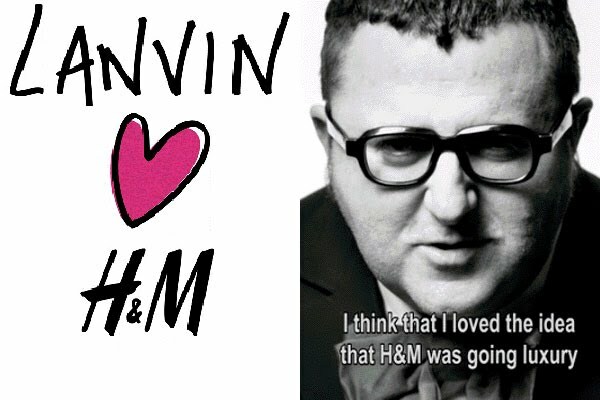 Even though Alber Elbaz from Lanvin has been quoted as saying that he’d never do a mass-market collection, he was too tickled at the thought of H&M going luxury: “This has been an exceptional exercise, where two companies at opposite poles can work together because we share the same philosophy of bringing joy and beauty to men and women around the world,” he says. Says Margareta van den Bosch, creative advisor at H&M, “We are thrilled about Lanvin’s collection for H&M, it is such an exciting moment. Exciting indeed. Lanvin is a well respected line and worn by the most famous celebrities. This collection is one that I will be standing in line for. I love when designers create affordable lines, I just wish that they would include plus sizes when they do. H&M is probably the most affordable clothing brand that offers the latest styles in fashion, so why haven’t past designers who’ve created affordable lines with H&M include plus sizes.When designers say that it cost too much money to add plus sizes to their collections, it’s opportunities like this that are a great way to include plus sizes. How come no designer has done so yet. In my opinion, a luxury designer line at a store like H&M, Kohls, and even Target would be a match made in heaven. If the designs are great an affordable plus line at any of these budget friendly stores could possibly prove to be a great test run to see the financial response from plus size shoppers.